The essence of my presentation is that those of us who learn from one another in online spaces are uniquely in position to inculcate similar learning strategies in their students. Students are already connecting and learning from one another online, but they may not be learning what their teachers think they should be (e.g. they are learning to collaborate, socialize, and create online, but not necessarily on what's in the syllabus). Teachers need to understand how to set up blended learning environments, as they do for one another, that encourage the kind of learning they know from their experience as master learners that their students need. 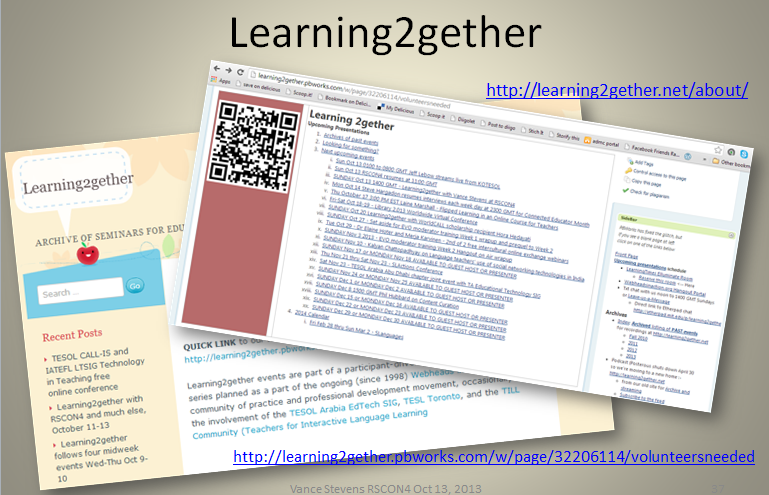 Only by experiencing such learning themselves, as we are doing at RSCON and each week at Learning2gether, can teachers be in position to guide their students' collaboration and creation online into sensible learning outcomes. This presentation draws on present circumstances to inform how we might rethink our role as educators, or perhaps more importantly, encourage others to follow our example. The presenter has been involved in coordinating two virtual communities that have been interacting and learning from one another daily for the past decade. These communities are Webheads in Action and EVO, Electronic Village Online, both of which have converged in an online space called Learning2gether, where weekly seminars are organized by participants for helping each other learn throughout their wider networks. This presentation will show through representative examples how participants in these networks acquire the tools for re-thinking how they engage their students. Networked learning is ineffable in that it must be experienced to be understood, and those without that experience have difficulty grasping a full range of its affordances. As the behavior of participants in online networked learning changes, so their teaching styles change, and the better they are able to model for their students characteristics of what they find most effectively leads to their learning what they want to know in an increasingly interconnected world. This presentation will be developed as one of those examples, as a model for community-based learning, with participants at the session being cases in point. In helping us reflect on our WOW or aha! moments that brought us here to RSCON, we can consider how we might help colleagues transform their world of learning, and how they can help their students acquire equally productive learning strategies. The presentation began with a digital story. "Once upon a time ... " teachers were isolated. This was a theme that arose in Sean Wilden's (2013) presentation at the TESOL CALL-IS and IATEFL LTSIG Technology in Teaching conference. It was a theme that I addressed in my first ever plenary address (Stevens, 2001), which dealt with teacher burnout and how the Internet was rescuing us from that by helping us overcome our "firewalls of the mind" (the plenary was delivered in Nicosia, a city with a dividing wall, and 'wall in the mind' was the condition East Berliners found themselves in once their wall disappeared but they found it took longer to overcome the mindset that the wall had engendered). But back in the read-only century, teachers, while not exactly monks working alone in cloisters, were quite isolated compared to as they are today. This was right at the turn of the century, a time we now know we went from what Lawrence Lessig (2004) has characterized as the read-only century and headlong into the read-write century. At the time, teacher burnout could lead aging Saudi hands to suicide and certainly contributed to their difficulty finding work if they stayed too long in the Kingdom. They stayed for the money, but in the bargain lost their competitive edge, due to the isolation. 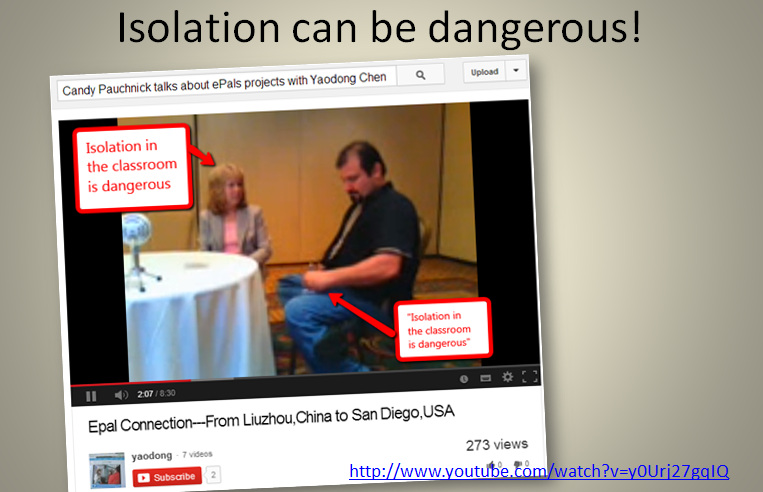 Is isolation really dangerous? Candy Pauchnick said as much in an interview with Kevin Honeycutt on Driving Questions in Education (Honeycutt and Pauchnick, 2008). 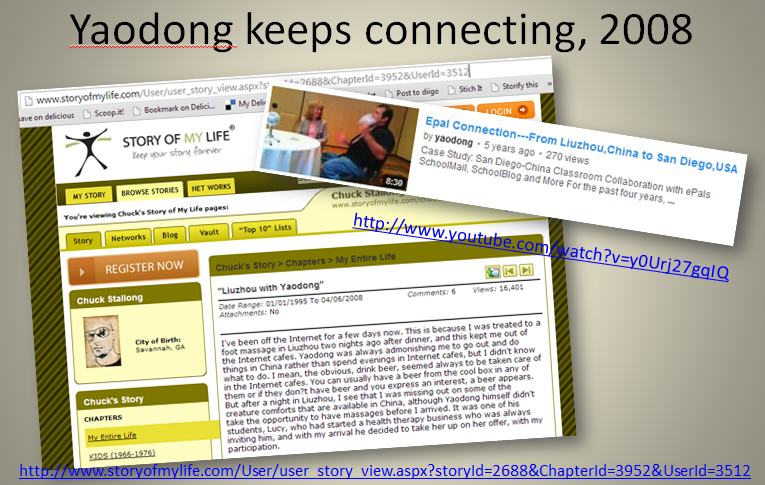 Candy made the point in the context of explaining her efforts to connect her class in San Diego with a partner class in Liuzhou, China, through ePals. Whatever the threat level, the Internet came along in the nick of time for teachers like me, Candy Pauchnick, Yaodong Chen, and Kevin Honeycutt. 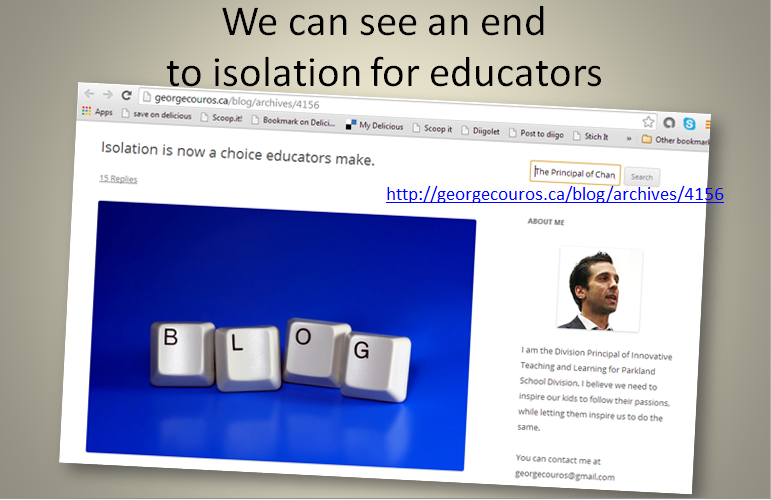 And nowadays, as George Couros (2013) has said in a recent blog post, isolation has become a "choice educators make". In most cases, it's no longer a predicament which they can do nothing about. 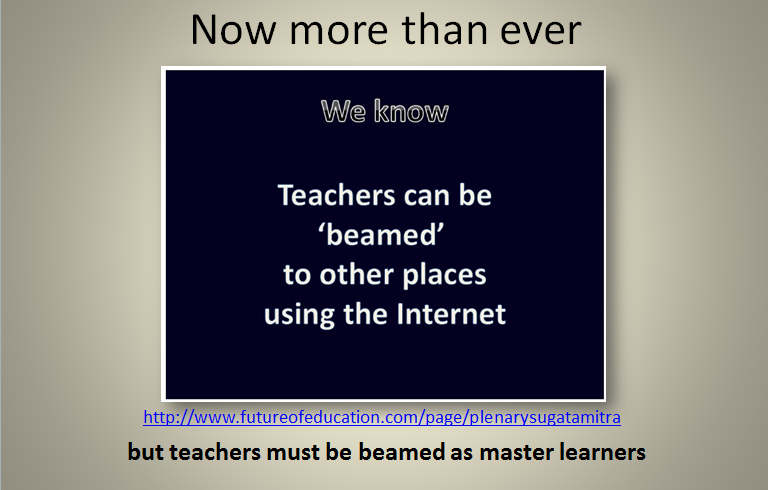 Sugata Mitra (2013) included a slide in his keynote address at the recent Reform Symposium where he pointed out that "We know ... teachers can be 'beamed' to other places using the Internet." This is indeed common knowledge, but we have to be careful with what exactly is being beamed. We have to be careful that when we are transported we are also transformed into a kind of teacher who is also a master learner, who continually percolates the teacher roles of modeling and demonstrating with learner ones of practicing and reflecting, and have all those elements working together to continually adapt what is being taught to the way in which learners are continually adapting the way they learn. 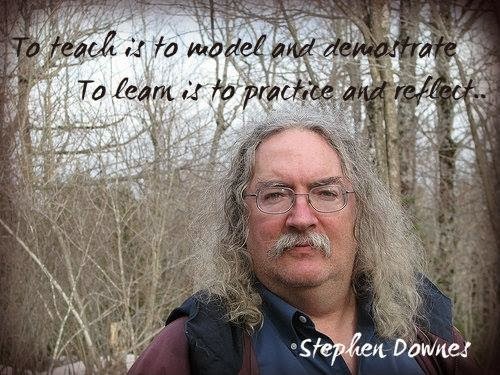 To elaborate on what is a master learner, I first heard the roles of teachers and learners characterized as being "to model and to demonstrate" vs. "to practice and reflect" in Stephen Downes's (2007) keynote presentation for the Webheads in Action Online Convergence. To me, that is a succinct characterization of what teachers and learners do, and I have often made the point in presentations since that master learners do all of these things in an iterative manner. That is, by doing these four things as a matter or course in one's workflow, master learners are constantly learning in order to teach, and teaching to learn, of course. 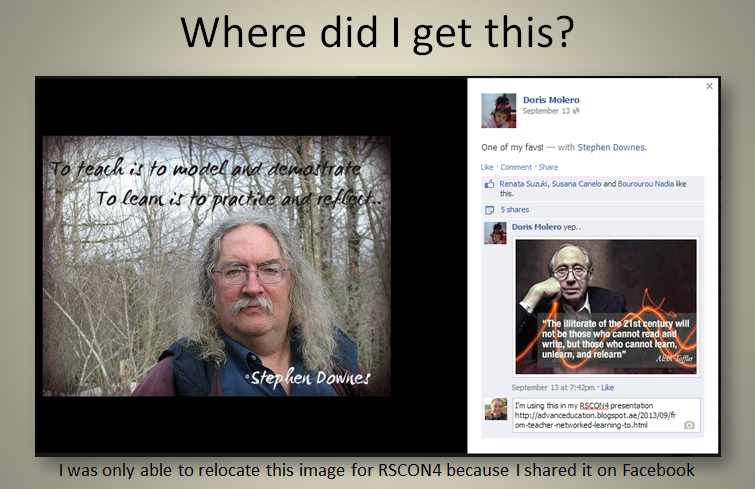 In several of my presentations, I have often borrowed Stephen's slide copied from his WiAOC keynote presentation, (such as in this one: http://www.slideshare.net/vances/modeling-social-media-in-groups-communities-and-networks-socialnetworking-2009-online-conference - Stephen shares his slides via creative commons license, of course). So thanks, Doris Molero for sharing this with me. But the point is, we are so far from isolation now that we take this kind of sharing for granted. Sharing introduces serendipity into our workflow. It puts us in touch with people who can help us improve our practice. It helps us expresses ourselves in ways that appeal to multiple modalities and enhance our transliteracies. We have reached the antithesis of isolation. We are co-habitating a staff room in the sky. Students too were isolated in the read-only century. CALL (computer-assisted language learning) had been around for some time before the Internet came into play shortly before the end of that century, but before then the crucial element of real interaction with other people was largely missing in language learning, whether or not technology-based. In a book I co-edited with Martha Pennington (1992) I contributed a chapter on humanism in CALL, at a time when it was debatable whether computers were inherently behavioristic or humanistic. Bernie Mohan had a chapter in the same book on communicative CALL, a study of student-student interaction while running CALL software. It was hard at the time to conceive how computers could be either humanistic or communicative, but now we know they can greatly facilitate human-human communication. CALL software at that time came mostly shrink-wrapped, and the first Web pages tended to be unidirectional static communicators, good ways for people to get messages out, but with no way to get messages back in. Gradually wikis were developed as tools for getting feedback at URL addresses, and in a few short years the Web 2.0 emerged to usher us fully into the read-write century with a whole plethora of social media sites and tools allowing us to not only interact with one another but automate the process of finding what we needed to know quickly on the Web. I moved from Oman to California in 1995 to take on my first job without students in 20 years. 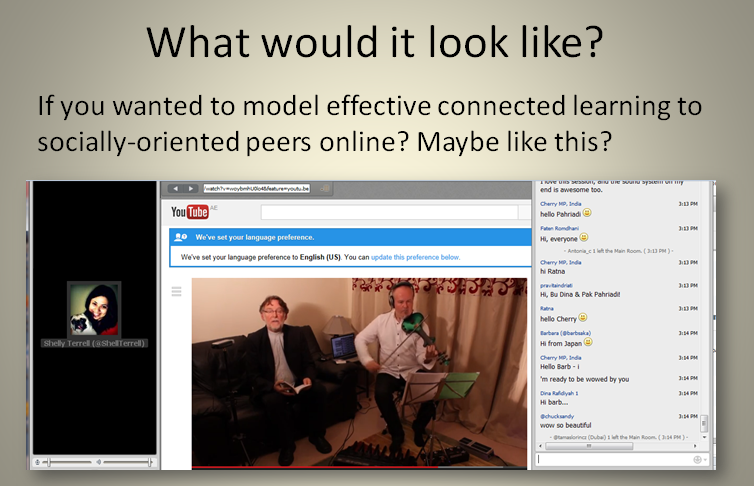 I missed them, I felt I had gone cold turkey, but it turned out that teachers of ESOL were among the first cadre of educators who were adapting the affordances of the connected Web to the circumstances of their hitherto isolated students. Many of us had experienced trying to learn languages from static and often contrived objects when we understood that what we needed was authentic language and real language input. The problem was that up to then, it was hard to expose students not already in a country where their target language was spoken, to the dynamic interaction they needed to constantly form and test hypotheses about how that language worked. 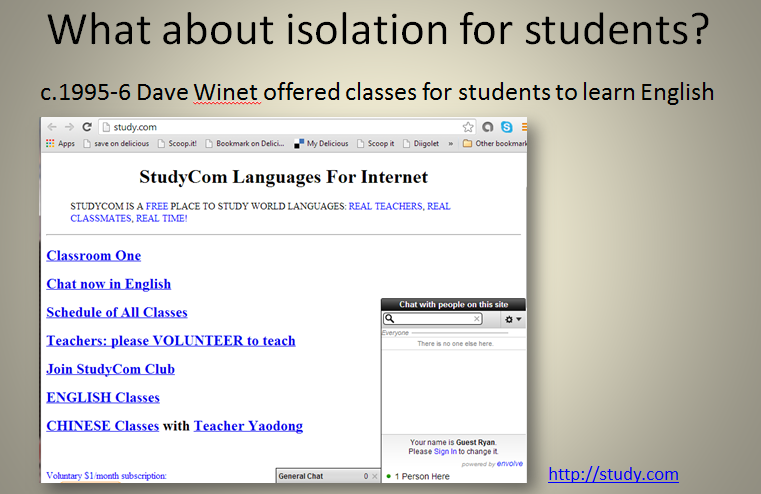 Shortly after my arrival in California, I came upon a site called Study.com, http://study.com, which had been set up by a teacher at Berkeley named David Winet who was using the tools at hand for getting students interacting with teachers and one another online. In the read-only century, his site was used only to advertise and hyperlink his services, and classes were convened by email. Amazingly, 17 years later, the site still looks, and works, much as it did then. But Dave's work helped us to answer one of the most important questions in e-learning of our time. 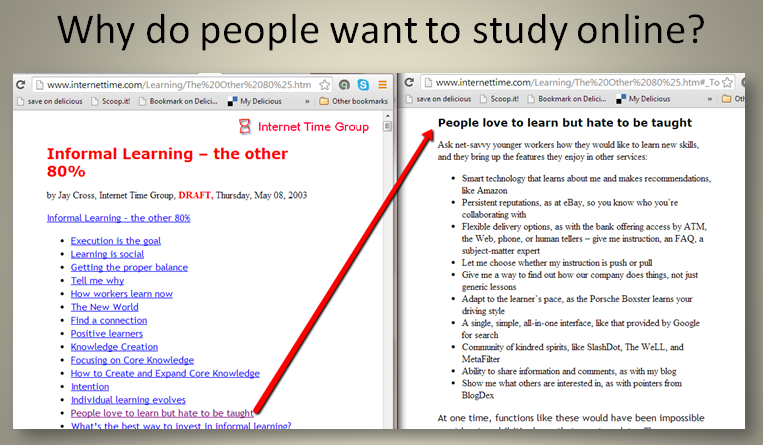 Why do people study online? Jay Cross (2003) has a chapter in his book Informal Learning entitled "People love to learn but hate to be taught." This is exactly what we discovered when we started teaching people via email study groups in our Study.com classes at the end of last century. These classes tended to last through a round or two, or three, of introductory emails which tapered off quickly as the work envisaged by the teacher did not meet the social expectations of the students. It was these expectations that had enticed them to try out online spaces to begin with (not the learning per se, but rather social learning as conceptualized by Vygotsky). We didn't fully understand this at the time, but as it happened, one of my students (from Italy) was a Web designer, and he set up a Web site for my course with a half dozen pages. The power of hyperlinked text was so obviously the correct way to conduct an online class, it didn't take a weatherman to know which way the wind blows. This was my aha moment, but I could not rely on a student in my course to think as pedagogically as I did. I quickly taught myself HTML and prepared myself for the coming of the read-write century. Meanwhile at Study.com, Dave had connected with someone working with a start-up company called Coterie who was experimenting with online spaces such as Active Worlds, and who ran a Palace server where she had set up a Virtual Schoolhouse for Study.com. Dave was steering students who expressed an interest in "3D learning" to classes organized by teachers who were hanging out in these spaces. By now I had moved to UAE and taken my formerly email-driven 'writing and grammar' class to the Palace. My classes ran temporally adjacent to another Study.com class facilitated by Maggie Doty and Michael Coghlan. Inevitably we overlapped, and eventually we merged. Our students took the merger in stride, and didn't seem particular about what teacher they found when they came to the Palace or what had been planned for them there. In fact we came to realize that what they wanted was not a course with a beginning and an end but a chance to socialize and interact with native speakers and each other. In other words, they were seeking a community, and we teachers were interested in taking the opportunity to work with the students who could help us learn how to facilitate that. The match was sustainable and grew into Writing for Webheads, http://prosites-vstevens.homestead.com/files/efi/webheads.htm. Putting my HTML skills into play I created a Web site to make a space where our students could display their writing. It was writeable only by me, but we had other online spaces, such as our eGroup (later, YahooGroups), where students could post their writing, and I could transfer their writing and any responses to the Web site. Eventually students started sending their photos to be posted online, and their recorded voices, and all kinds of objects that revealed their personalities, and before long we had a community of over 100 users. It became possible at that time for us to download a plugin to embed into our web site that would allow us to speak to one another in real time (for free, amazing!). This was quite unique at the time and started attracting teachers to our online sessions. One of these teachers in fact came to us as an English language learner from China, albeit one with an excellent command of English. This was the Yaodong Chen whom Candy Pauchnick had partnered her class with when she was interviewed by Kevin Honeycutt, when she pointed out the dangers of isolation in the classroom. 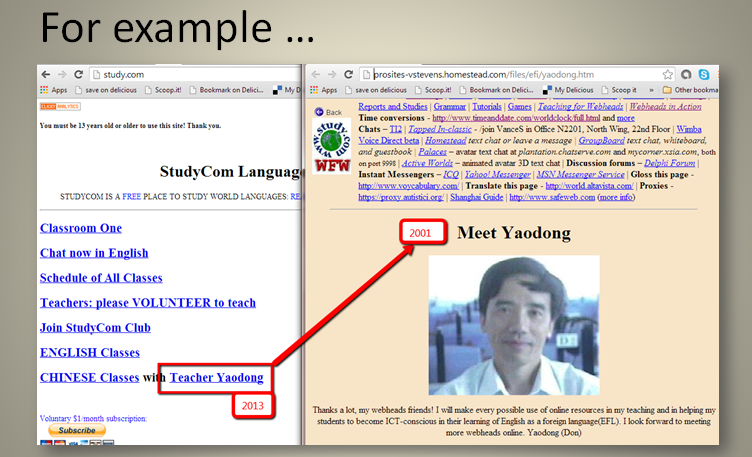 And closer examination of the Study.com website reveals also that Yaodong is currently conducting classes in Chinese, 12 years after he started interacting with Writing for Webheads in 2001. 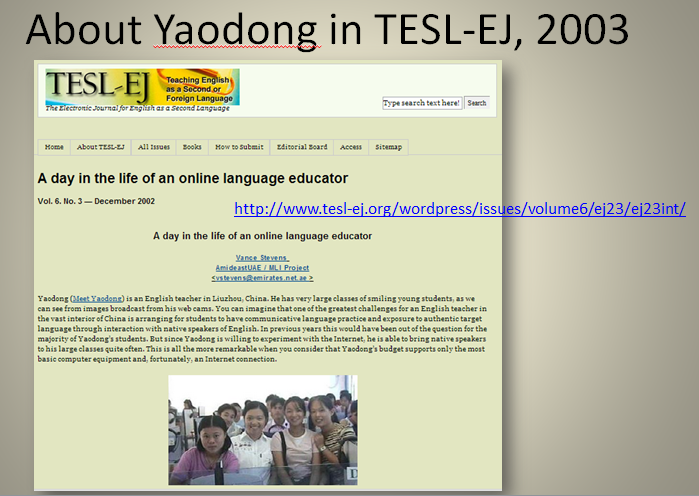 Yaodong was so conspicuously interactive across our learning communities that I wrote an article about him as my first contribution to the On the Internet column of TESL-EJ when I took over as editor of OTI in 2002 (Stevens, 2002). One of the participants in that event was another Writing for Webheads member from Taiwan, working as a naval architect in Japan, named Sue (pictured above, in the red circle). Although we knew her only online Sue planned post-graduate studies in Texas, and wrote us for recommendation letters, and also got us to help her arrange her mother's visit visa to the USA (by attesting to the likelihood that her mother would not attempt to remain in USA). 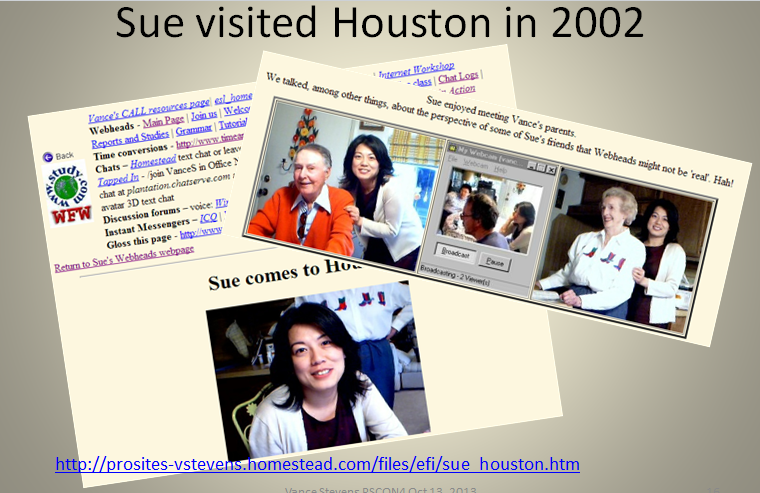 In 2002 when I was visiting my parents in Houston, Sue decided to drive down from nearby Bryan, and meet my family. That visit is archived here: http://prosites-vstevens.homestead.com/files/efi/sue_houston.htm. One interesting aspect of the visit was when Sue told me that her friends thought she was wasting her time with the Webheads community, because, they said, it wasn't 'real'. Her friends were courting isolation in their online learning experiences, Sue was not. In Writing for Webheads, we were learning all the time about how to structure learning to meet social expectations. We were learning from the students who interacted with us how to construct communities that would promote language learning through greater opportunities to socialize in spaces with very low affective filters where the target language was used throughout. This knowledge was applied in Webheads in Action, where we taught one another experientially, as we continued learning community building techniques in spaces where technology was being used online to promote greater awareness of how it might facilitate language learning. At the turn of the century we had almost as many teachers in our Writing for Webheads group as we did students, and the native speakers of English began to suppress the NNS, who became quieter as the natives grew more interactive. Meanwhile, in 2001 the TESOL CALL IS (Teachers of English to Teachers of Other Languages, CALL Interest Section) had taken its annual Electronic Village, which had become a fixture at annual on-site TESOL conventions, online in what was called EVO, Electronic Village Online. 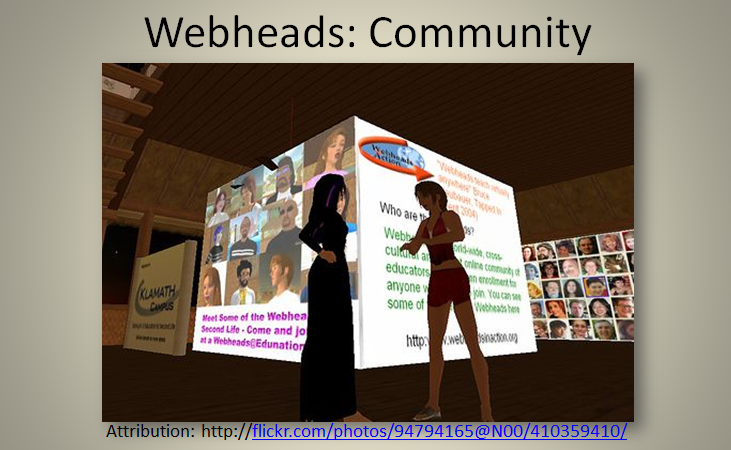 Realizing that Webheads needed to be two groups, one for students and the other for teachers, I proposed an EVO session for 2002 whereby I would show teachers how to form communities online by managing our session as just such a group. I called the session Webheads in Action. 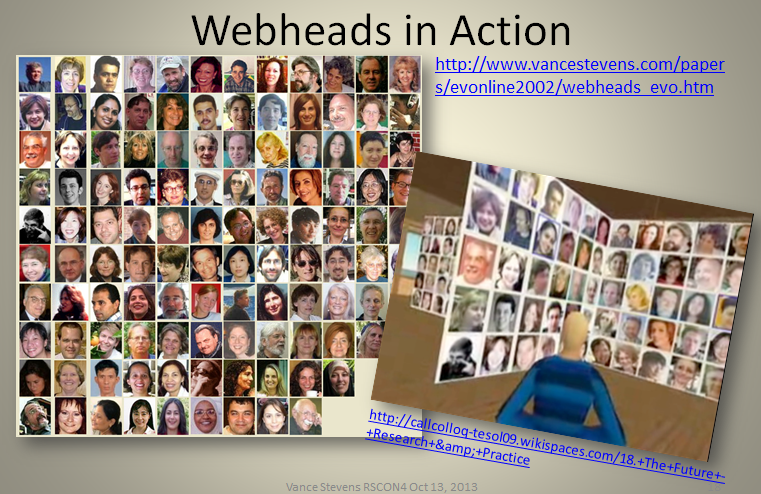 Webheads in Action came along at the right time. It attracted cutting edge participants who were looking for others who could discuss with them and help them with issues around educational technology applied to language learning. The group burgeoned from a few dozen original participants to over 1000 in the YahooGroup now, but literally countless others in many overlapping networks. The most definitive WiA portal page is here: http://www.webheads.info/. The original WiA group website is still online here: http://www.vancestevens.com/papers/evonline2002/webheads_evo.htm. As with the student group, WiA participants enjoyed sending their photos to be placed on the front page of the website (this was six months before Moodle debued in August 2002 and started associating faces in profiles with postings. Facebook came later, in 2004). The photo montage of WiA participants was unique at the time and has served as wallpaper in at least two different images captured from Second Life builds; e.g. http://callcolloq-tesol09.wikispaces.com/18.+The+Future+-+Research+&+Practice (above) and http://flickr.com/photos/94794165@N00/410359410/ (below). When I made the screen shot above, I was at work in a staff room full of silent teachers each doing his/her own thing in his/her own PC. The atmosphere is good in our staff room, we interact from time to time of course, and sometimes call meetings outside the staff room for that purpose, which puts whatever learning takes place there in the area of 'formal' learning, where there are high stakes connected to one's employment. The staff room on the other hand is informal, and it's often a good place to interact with colleagues in griping or laughing, and even over professional issues that arise. But at the moment it's silent, each of half a dozen teachers there buried in the laptop at his or her desk. There is nothing wrong or unusual about this. I am one of the silent teachers in this staff room. 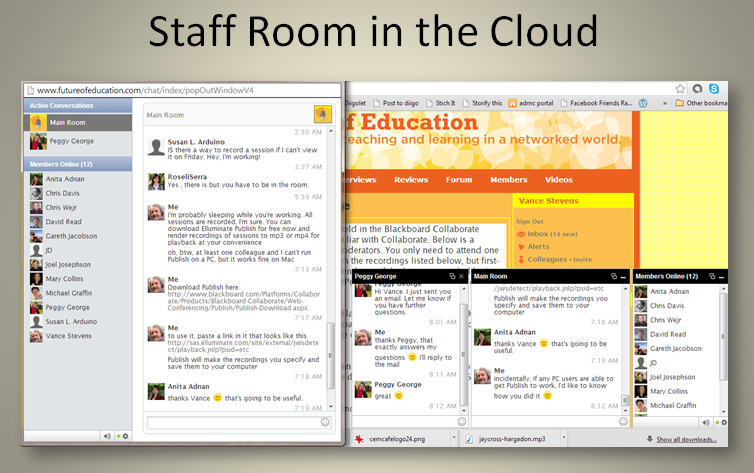 But I'm in an online staff room as well, each teacher in his/her own PC somewhere in the world but not at all silent, as we can see from this screenshot of the RSCON4 Ning virtual chat space, where teachers from all over the world were engaged in fruitful chatter in the staff room in the sky. In this shot I am multitasking while doing school work, getting immediate help from Peggy George on something I didn't understand about my RSCON presentation, and helping someone else who wondered how to get an mp3 of the presentation recordings. It is evident from what goes on in such chat spaces that a lot of learning as well as socializing takes place. In the real staff room, interaction is largely social. People don't like to intrude on others who are seemingly busy, so they wait for an opening, which might come at a time when they have nothing weighty to say. But like sending a txt msg as opposed to a phone call, an online msg allows the other person the chance to put off the encounter for a few moments while putting last touches on work about to be deferred. Also as with txt msgs people mostly send them when they need information, not just for chatter. So interactions in online spaces tend to be more to the point than in face-to-face ones. When they are used, work tends to get done there. They are always on, yet can be rendered unobtrusive. They are not necessarily 'better' than f2f interactions, but the affordances mentioned suggest they can be used productively in ways not common in f2f encounters. Here is another example of staff room back chatter resulting in serendipitous learning. We are at Gavin Dudeney's presentation at the TESOL CALL-IS and IATEFL LTSIG Technology in Teaching conference Oct 12, 2013. Someone in the room wants to know if she can have a copy of the last slide. Gavin is presenting and doesn't notice the question, so I made a quick screen capture of Gavin's slide using Jing and saved the capture to the cloud so that it was given a URL. I then passed on the URL of the captured slide to my fellow participant at the session. That participant was not familiar enough with the technique to have thought of it or didn't have such a handy capture tool (though there are at least two that come with Windows, prt scrn pasted to Paint and the relatively new Snip tool; and something similar with Macs). But the realization that a slide can be captured and does not need to be requested is one that has possibly prompted this participant to try it out when next needing a capture. Thus participation in online events with other educators helping one another contributes to one's overall familiarity with technology and this will inevitably trickle down to students, when they find themselves in a situation which the teacher can resolve by pulling a screen capture tool from his quiver of tricks. 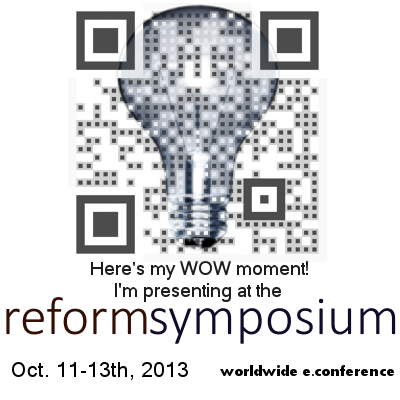 The Reform Symposium Conference where this presentation was made is but one of a myriad of events taking place almost constantly now where teachers have opportunities for meeting in online spaces and sharing information and expertise with one another. Conference organizers such as Steve Hargadon and Shelly Terrell are two of many involved in a firehose of events that have been taking place with increasing frequency, in their case sometimes only days apart. The MOOC concept, whether xMOOC or cMOOC, provides steady often overlapping opportunities for deeper, more prolonged engagement not only with niche topics, but more importantly with others interested in those niches. Google Hangouts on Air now make it possible for anyone to simulcast an event, and many do, extending invitations to colleagues in a mushroom field of communities. It seems there is something of this nature going on every minute, and social media is working virally to spread the word of such gatherings among educators (Facebook, Google+, and Twitter are but a few social spaces with frequent announcements of online events and Hangouts). 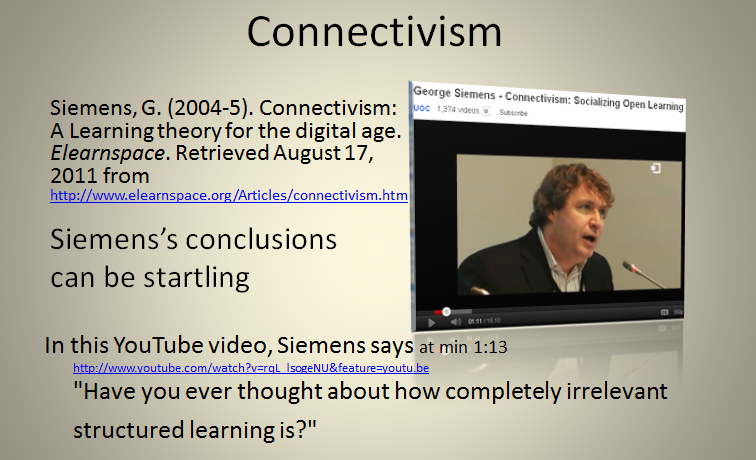 Stepping back to a wider perspective on this phenomenon, what is going on every minute is networked, connectivist learning. Every minute! Open education, driven by learners connecting with other learners, is taking place around the clock, around the globe, in countless free spaces, bound only by the amount of time participants can make to engage and absorb the knowledge inherent in their networks. The possibilities this unleashes are only starting to be realized by the brick and mortar establishment. Not that we should quit our daytime jobs any time soon, but we should certainly rethink them. We are tending toward disappearance of isolation among teachers, especially the ones who are present at this conference. Mindsets for some have remained static, but such people are dwindling as well. 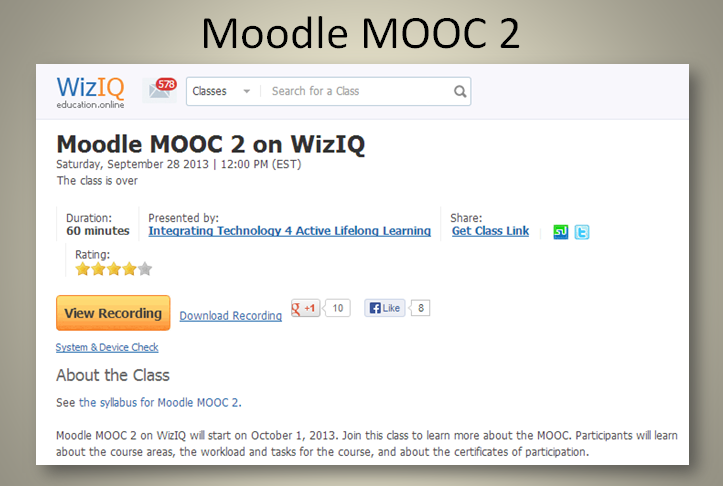 Nellie Deutsche is running Moodle MOOC 2. This free online course follows Moodle MOOC 1 and precedes Moodle MOOC 3 which is just now getting organized. It's a space where people can not only sign up for tutorials on using Moodle, but also tune in to presenters such as Brian Alexander, Stephen Downes, Dave Cormier, and Michael Wesch (and replay the recordings on YouTube). They can also see modeled for them one way to conduct an effective online course using WiZiQ as a platform in conjunction with Moodle. 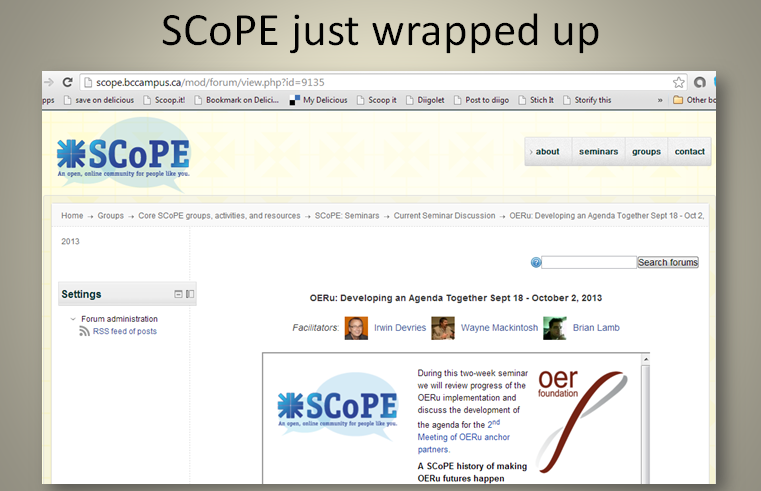 SCoPE http://scope.bccampus.ca/ is a forum that hosts topics putting participants in direct touch with people whose writings and blogs they might be familiar with. It's a friendly and informative professional space. 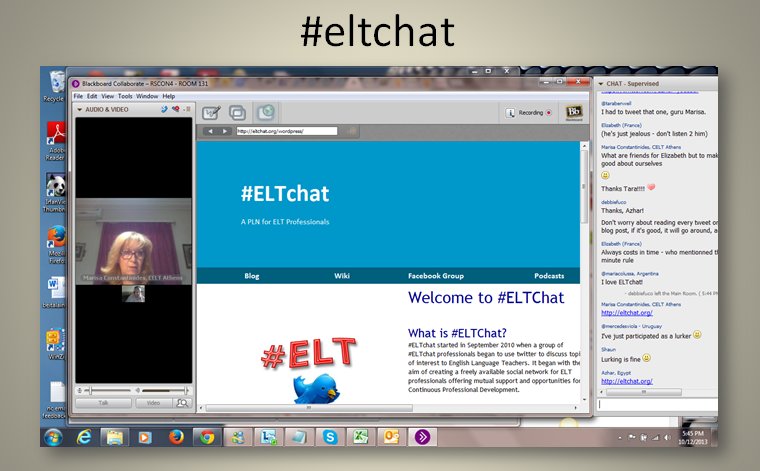 #eltchat was presented by Marisa Constantinides at RSCON. It's a Twitter hash tag followed by many in the field of ELT. This is also a space for concise interaction with peers as well as well-known leaders in ELT. RSCON4 Oct 11-12 is the Future of Education symposium of which this presentation was a part. It had three straight days of presentations. On Oct 12, there was an all day seminar for TESOL CALL-IS and IATEFL LTSIG. 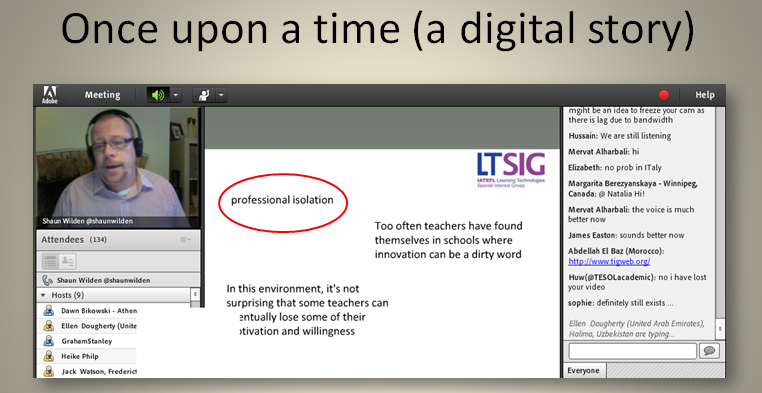 IATEFL SIGs have frequent webinars, all recorded, though recordings tend to be restricted to SIG members. 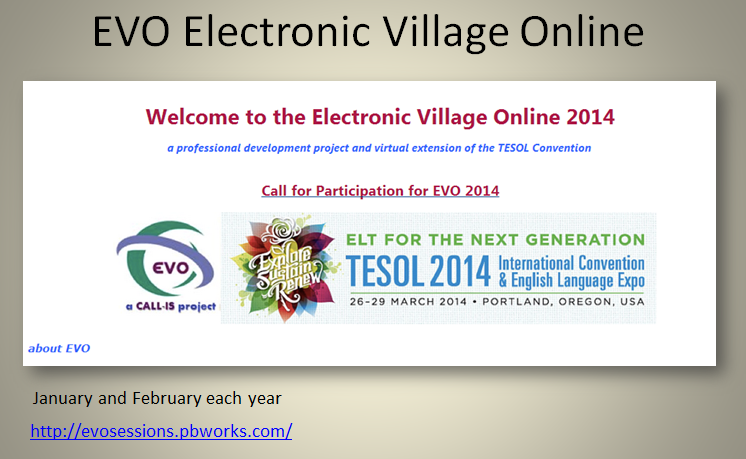 EVO (Electronic Village Online) is an annual set of 5-week sessions, each January at http://evosessions.pbworks.com. Moderators are trained by EVO coordinators and their sessions are screened after training to ensure they meet minimum viability benchmarks. Thanks to this approach they are rarely a waste of anyone's time, and might even be the best collection of free edtech workshops with language learning focus on the planet. For something so significantly important to the direction of education in our connectivist read-write century, there is a lot of confusion over how MOOCs started, what they are, and what their future is. In a nutshell, they were started by George Siemens and Stephen Downes in 2008, with the help of Dave Cormier. Dave and Brian Alexander jointly coined the term MOOC in the course of a conversation (and neither currently claims to be the originator). The first MOOCs were connectivist, or cMOOCs, but eventually big names in education made successful proof of concept ventures on mainstream college courses and even Bigger Name companies were formed which started cranking out courses for the masses, called xMOOCs. This muddied the waters around the origins of MOOCs and you now have educators who should know better stating at conferences and in print that the first MOOCs were xMOOCs. Obviously the concept has grown too big too fast but is set to grow bigger as educational institutions grapple with how to leverage what's abundant (knowledge and bandwidth) against what's scarce (bricks and mortar, and money). 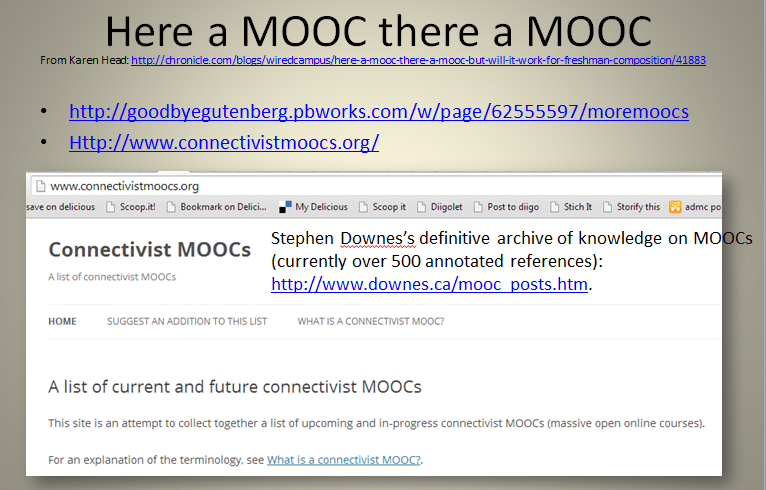 Possibly the most comprehensive compendium of knowledge on the topic is Stephen Downes’s definitive archive of postings on MOOCs (currently 587 annotated references) at http://www.downes.ca/mooc_posts.htm. Sadly the last reference is from June 20, 2013, and it seems the great compilation may remain a listing of 587 annotated references from 2008 to then. This chapter describes a course in teacher professional development run on a MOOC model. MOOCs (massive open online courses) enable learners to discover and apply underlying structure to their perspective on a course according to their own experience and notions of learning, as opposed to following a path pre-ordained by a prescriptive facilitator. Participants utilize networks to find pathways leading to collaboration around shared learning goals. This differentiates master-learners from novice-learners. When learners must adapt to jobs that haven’t been invented yet, teachers must help them become master learners in preparation for unanticipated future challenges. MOOCs deal with learning why, applying critical thinking, applying one’s own schemata, and reaching the higher echelons of Bloom’s digital taxonomy. Focus is not so much on training how to do particular things, but in developing approaches to learning as might be appropriate to the students’ future contexts. Teachers trained in MOOC techniques (meaning they participate in MOOCs and therefore have modeled and demonstrated to them those techniques) might apply similar methods in their teaching, thus introducing their students to networked learning methods that will help them in future endeavors. This suggests that those with experience in MOOCs are uniquely able to utilize appropriate affordances of MOOCs to their teaching situations, and thus widen the learning horizons of their students. The WiA EVO session achieved its aims through adherence to two rich principles inherent in successful community formation online. First there was an existing example in Writing for Webheads and a facilitator who was able to model techniques that had worked in forming that group for the participants in the new group. The second principle is that the mode of teaching was through experience and experimentation. Learning via social media is ineffable; it has to be experienced in order to be understood. It is difficult to explain how it works, like trying to explain how a plane flies to someone who has never seen one. Until you see or experience it, you can't 'know' it. 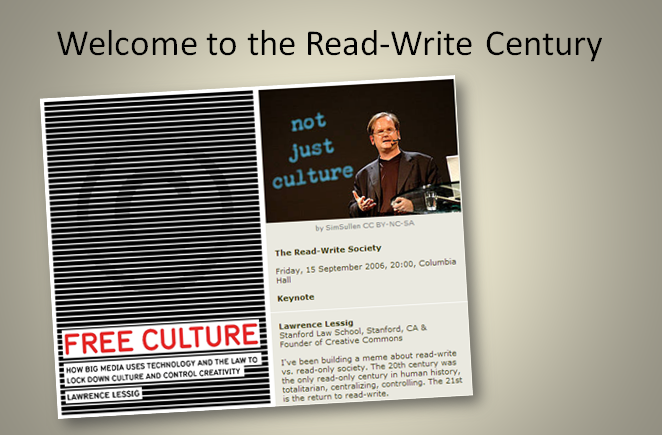 There are other principles that have been developed and exercised through groups, communities, and networks that have formed from the seeds planted at the turn of the read-write century. One is that communities, like a good party, require a critical mass to boost them into higher quanta. There is a tendency for people who create online classes to restart their communities with clean slates, to assume that the community will come together better if the newcomers to the community work only within their cohort and bond without interference from previous group members. This might work, and relief from clutter might even be more comfortable for some moderators and participants, but something is also lost by not actively including previous group members in your new venture. Thus it is common in EVO, for example, for session moderators to start up new YahooGroups or keep old ones but delete forums and comments from previous sessions. This is indeed the model most of us have been educated in, where we walk into a classroom where the work of all previous students has disappeared from the walls and bulletin boards and for all intents and purposes, the course is designed for us, and we are the only group that has ever taken it. 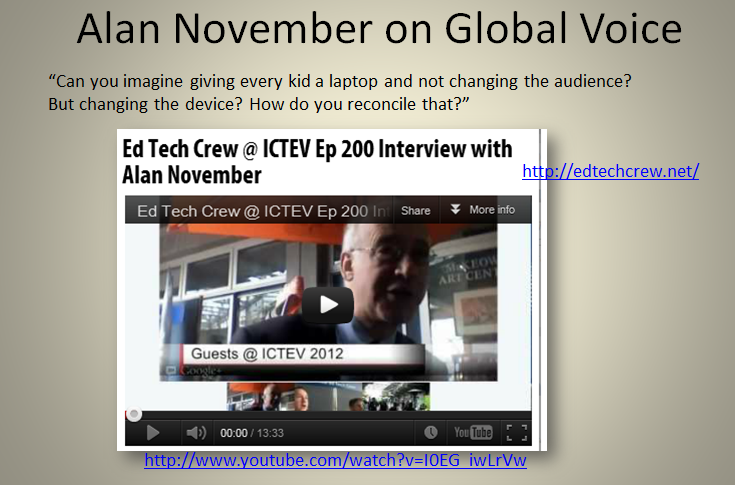 Alan November was talking with Tony Richards and Darrell Branson of the EdTech Crew after his keynote at a conference in Melbourne, when he said, "Can you imagine giving every kid a laptop and not changing the audience? But changing the device? How do you reconcile that?” He pointed out that classrooms can and should be communities where the work of previous students serves to model and set standards for subsequent students to emulate and improve on. At the very least, students consider that work they produce will be seen by students in following years, and the effect can be enhanced if the audience for their work when they are producing it extends beyond the classroom. When students are creating digital portfolios, it becomes easier to share their work with peers worldwide and with current and later students. We can experiment with this notion in the online communities we set up for one another. For example, the YahooGroup we set up for Webheads in Action is still going strong ten years later, and when I started teaching a course I called Multilteracies as part of TESOL's Principles and Practices in Online Teaching program, I proposed it as an EVO session and set it up so that I could bring the community from EVO back into the TESOL course the next time I ran that one, and so on, so there was always enough of a critical mass to stimulate the TESOL participants even though there might only be a dozen of them. With few participants it's difficult to get them interacting with each other in ways that are not teacher-prompted. But when there are previous participants in the mix, there is more participant-to-participant interaction, and everyone learns how this works as and when it works. Here we can state these principles, but teachers are convinced only when they experience them in action. George Siemens has just written to members of his Change MOOC Google Group to tell them he's going to roll the same group over into a new Research MOOC discusson. His intent was clearly to preserve the community that had formed there, while giving due notice that there might be an increase in list traffic on a topic different from the one he had started the group to address, in case any list members might want to withdraw to prevent their inboxes filling with posts on an unsolicited subject. Those who responded appear happy to stay, but what if this was the way all classes worked, where students who wanted to could opt in to continue interacting with teachers and peers, and subsequent students, whom they might help in ways that foregoing students helped them. It should be normal that we continue our community sites from one topic to the next, from one cohort to the next. Doing it this way might be disconcerting to some who don't like clutter, but if we accept that learning is messy, if we embrace and exploit chaos and exploit chaos resolution as an opportunity for deep learning, then we tap into one of many benefits to working individually but within a wider community. Chaos resolution underpins George Siemens's teaching style, which he deliberately embraced when he with Stephen Downes and Dave Cormier started the first MOOC in 2008, and this concept has to some extent already turned on its head the notion of how we carry out and allocate resources to education. 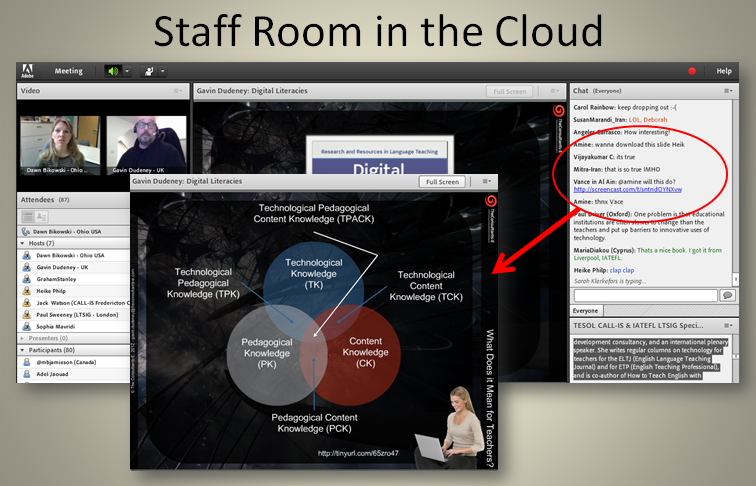 MOOCs are powered on the affordances inherent in interaction of a critical mass of participants. Survival in MOOCs requires enabling strategies in both facilitators and participants to cope with the massive scale of participants. Filtering skills must be employed for participants to gain meaning from instructional material that cannot possibly be directed at the individual. Individuals must in this case derive meaning from their experience with that material as percolated through the community of other participants, an only limited number of whom they might interact with during the course of the MOOC. Most importantly, there is transfer of much of this into our classes. I read an article once in the early days of CALL where a teacher was asked if she used technology with her students. Her initial response was no, but on examination it was found she was using all kinds of technology to prepare and deliver her lessons, from Word and PowerPoint to the data show projector in her classroom, not to mention the photocopier, Google to find materials, and so on. So there is a lot of technology that is taken for granted, and not really factored into the equation, especially as it becomes 'normalized'. The question now is to what extent this interaction among teachers finds its way back into our classrooms. I would say to an increasing extent. As in the case above our classrooms will change when our practice has changed but it's become so second nature we don't notice it. 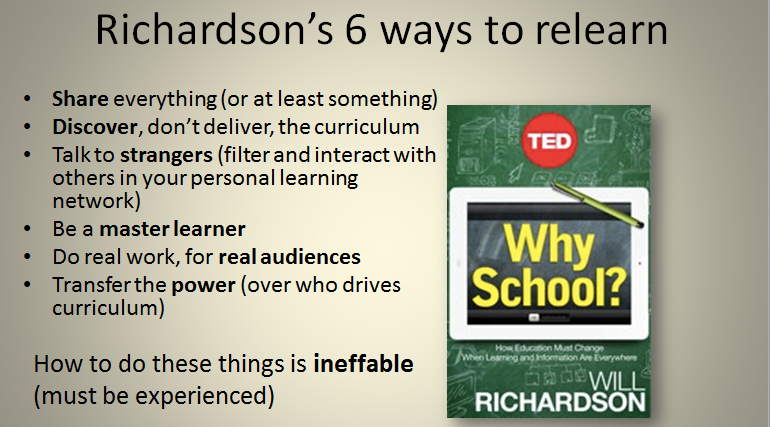 What if we asked teachers if they adhered to the six things that Richardson says they need to do in order to relearn their practice? Did you share something today with a wider community of educators? What have YOU and your students discovered about the curriculum recently? 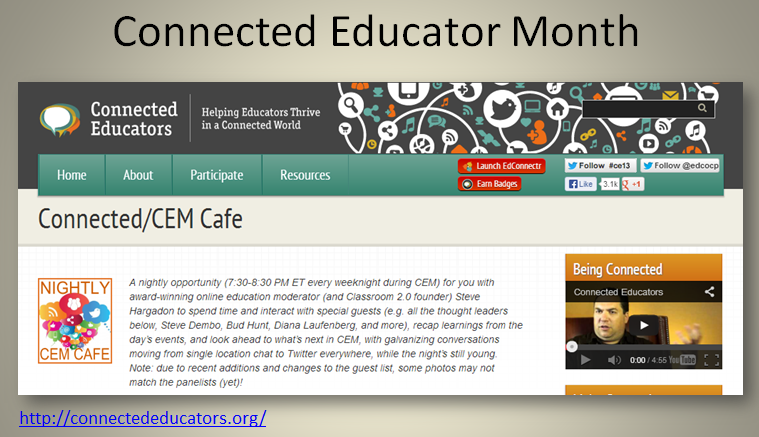 When did you last interact with others in your personal learning network? What filters do you use to help you moderate the abundance of information you must deal with constantly? How many functions of a master learner learner did you perform today? model / demonstrate / reflect / practice? What work have you assigned your students for real audiences? Who has power to drive curriculum where you practice? All of these actions are modeled, demonstrated, reflected on and practiced in learning with cMOOCs, where learning is by definition connectivist. Answers to these questions can tell us how likely a teacher is to be modeling these actions with students, and to be encouraging learners to be learning in the same way he or she does. Our mindsets must change so that students can be inculcated in the same way we are learning to learn. Transformation will have occurred when it is no longer meaningful to answer such questions, when everyone does these things as a matter of course. Our students are already connecting with one another, and if the devices are in place, as Alan November said, and teachers are still expecting them to produce for the old audience of one, there could be serious disconnects. 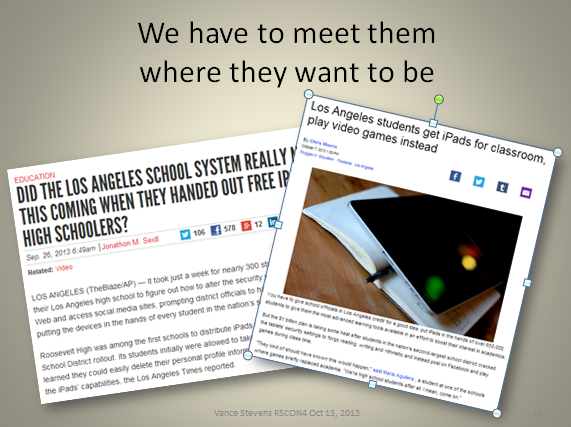 Take for example the recent iPad rollout in Los Angeles Unified School System. The students used their devices in the most engaging ways they could imagine, but these were not connected in any obvious way to the syllabus. They got around the Internet filters by simply deleting their profiles from their new devices. Another famous case is that of Tom Wood in Australia, who managed to hack the national school Internet filter in only half an hour. According to these news articles he was treated as a hero to those who thought the filter was a waste of money, and turned thinking in that country into avenues of control over use of technology to ones more inclusive to all stakeholders into the dialog. 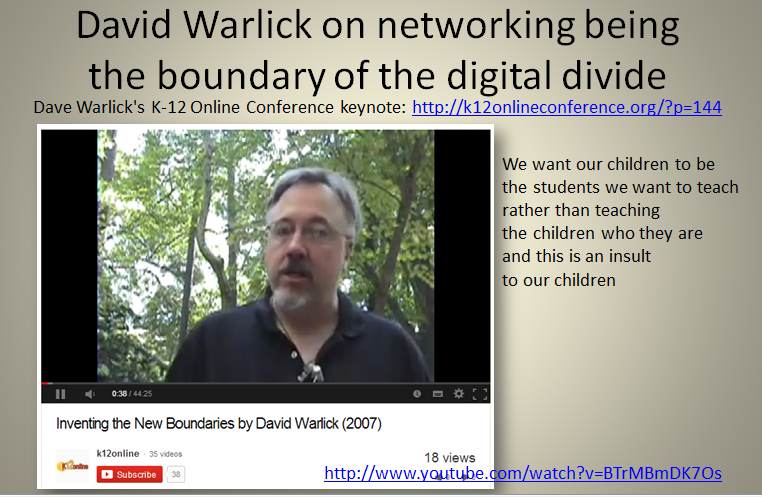 In his pre-conference keynote at the 2007 K-12 Online Conference, David Warlick (2007) David Warlick said that networking was the boundary of the digital divide. He gave the example of his son and how he learned and played with friends online, how he didn't need to say goodbye to his friends when he went to college, and how kids obtain power from their networks. He speaks passionately about how wrong it is to cut kids off from their networks when they go to school. "We want our children to be the students we want to teach rather than teaching the children who they are, and this is an insult to our children"
This is the audio segment where Warlick articulates that quote. How then can we break down the firewalls and give our students access to learning networks in our classrooms. 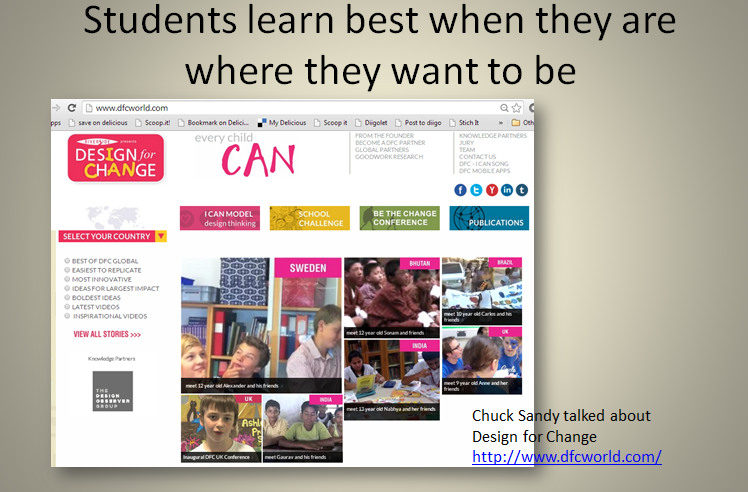 In his RSCON presentation, Chuck Sandy talked about, one classroom, one teacher, design for change http://www.dfcworld.com/. In this project, students design projects (e.g. public works, school beautification), carry them out, document them, and share them. I'm afraid I've bumped against sleep deprivation here but I've got most of what I want to say down on silicon. I need to cut it back of course and fine tune the references, but the essence is here. The video here is two hours long, but if you listen up to a little past the point where I use the word "erudite" you'll hear what I mean to get across. As Bax's predictions have come to pass and the microprocessor has been normalized into most appliances we own, the notion of computer-assisted language learning becomes almost meaningless. Except to the most extreme Dogme purist or educators in contexts where not even electricity can be taken for granted, the notion of CALL is more meaningfully expressed, in my view, as SMALL, or social-media assisted language learning. Couros, G. (2013). Isolation is now a choice educators make. The Principal of Change: Stories of learning and leading. Available: http://georgecouros.ca/blog/archives/4156. Cross, J. (2003). Informal Learning – the other 80% (draft). Internet Time Group. 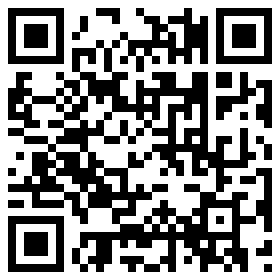 Available: http://www.internettime.com/Learning/The%20Other%2080%25.htm. 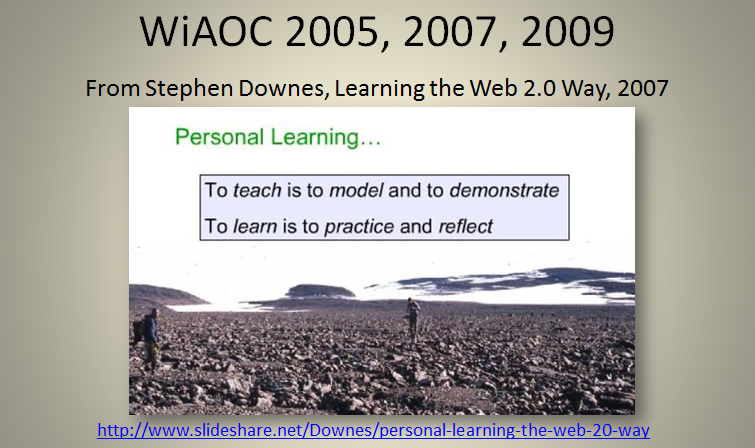 Downes, S. (2007) Personal Learning the Web 2.0 Way. Presentation given at WiAOC 2007. Retrieved September 25, 2009 from the World Wide Web: Slides, http://www.slideshare.net/Downes/personal-learning-the-web-20-way, Audio Part 1: http://streamarchives.net/node/84, and Audio Part 2: http://streamarchives.net/node/83. Honeycutt, K. and Pauchnick, C. (2008). Epal Connection - From Liuzhou,China to San Diego,USA. Driving Questions in Education. Available: http://www.youtube.com/watch?v=y0Urj27gqIQ; more information, http://groups.yahoo.com/neo/groups/evonline2002_webheads/conversations/topics/19526. Lessig, L. (2004). Freeculture: How Big Media Uses Technology and the Law to Lock Down Culture and Control Creativity. The Penguin Press, 348 pages. Available: http://www.free-culture.cc/freecontent/. Mitra, S. (2013). The future of learning. 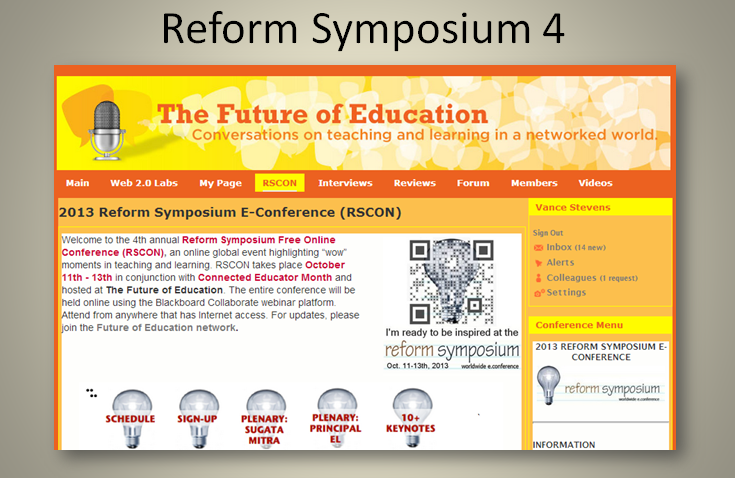 Opening plenary at the Reform Symposium RSCON4, http://www.futureofeducation.com/page/plenarysugatamitra. Richardson, W. (2012). Why School? How Education Must Change When Learning and Information are Everywhere. Ted Conferences and Amazon Digital Services, Inc., 51 pages (estimated). Stevens, V. (2002). A day in the life of an online language educator. TESL-EJ 6, 3. Available http://www.tesl-ej.org/wordpress/issues/volume6/ej23/ej23int/. Stevens, Vance. 1992. Humanism and CALL: A coming of age. In Pennington, Martha, and Vance Stevens (Eds.). Computers in applied linguistics: An international perspective. Clevedon, England: Multilingual Matters, pp. 11-38. Stevens, V. and Altun, A. (2002). 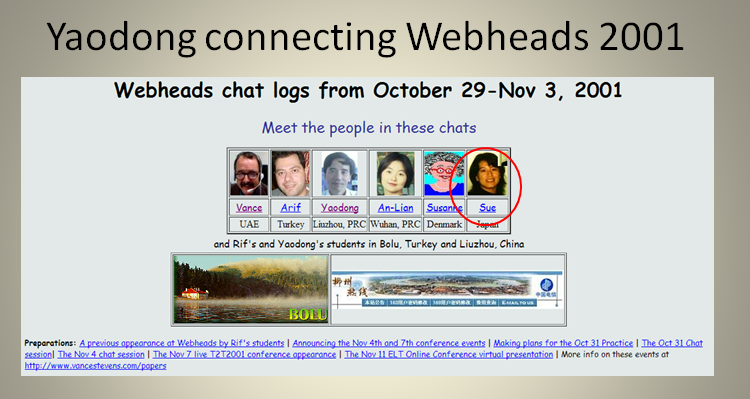 The Webheads community of language learners online. In Syed, Z. (Ed.). The process of language learning: An EFL perspective. Abu Dhabi: The Military Language Institute. pp. 285-318. Available: http://vancestevens.com/papers/archive/2001mli_stevens-altun2mb.pdf. Stevens, V. (2001). Implementing Expectations: The Firewall in the Mind. Plenary address given at the IATEFL and Cyprus Teachers of English Association Conference, Implementing Call in EFL: Living up to Expectations, at the University of Cyprus, Nicosia, May 5th - 6th, 2001 . Slides available http://vancestevens.com/papers/cyprus2001/plenary/index.html. Warlick, D. (2007). Inventing the New Boundaries. Pre-conference keynote at 2007 K-12 Online Conference. 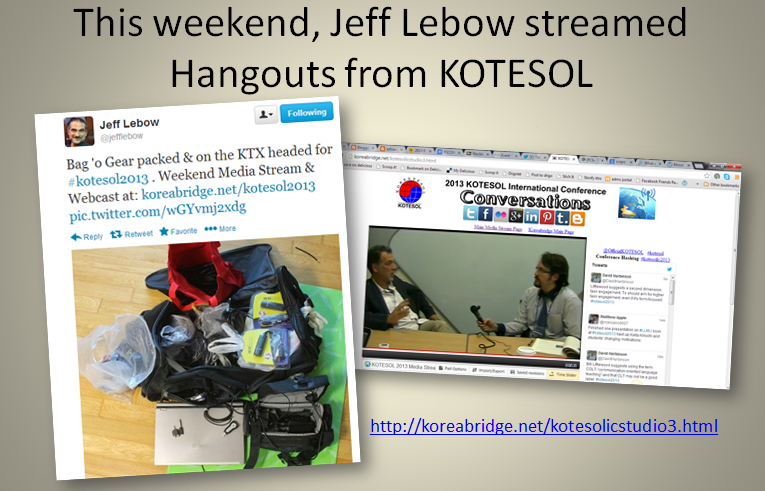 http://k12onlineconference.org/?p=144. Wilden, S. (2013). The role of online tools in teacher development. 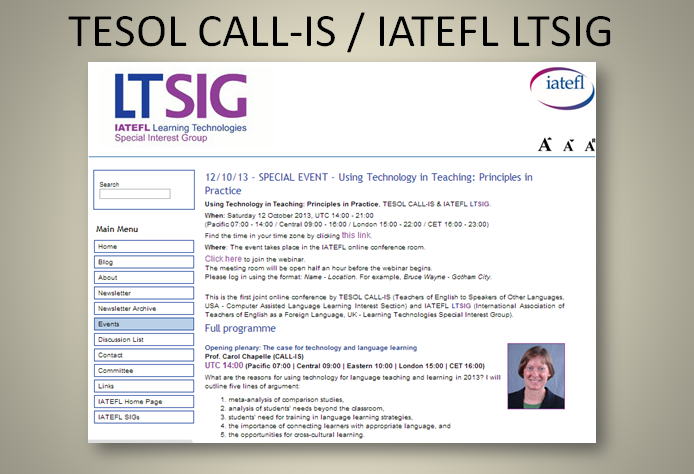 TESOL CALL-IS and IATEFL LTSIG Technology in Teaching conference, Oct.12, 2013 <http://ltsig.org.uk/events/13-future-events/318-121013-special-event-using-technology-in-teaching-principles-in-practice.html>;. Recording available: http://iatefl.adobeconnect.com/p7y3qn6nulj/. The twenty-first century could be different. This is the crucial point: It could be both read and write. Or at least reading and better understanding the craft of writing. Or best, reading and understanding the tools that enable the writing to lead or mislead. The aim of any literacy, and this literacy in particular, is to "empower people to choose the appropriate language for what they need to create or express." It is to enable students "to communicate in the language of the twenty-first century." The proposed book chapter refers to a session I've been facilitating for EVO, Electronic Village Online in one form or another since 2002. 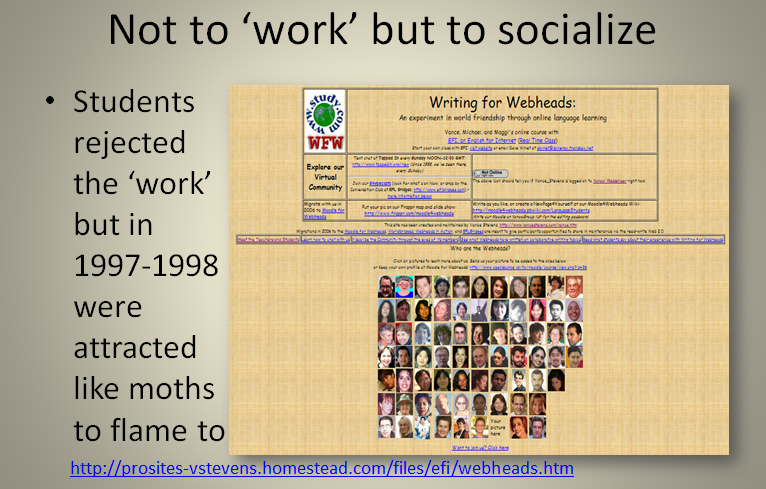 The session that year was called Webheads in Action, but Webheads went back even further than that, at least as far back as 1998, which is as far back as we have preserved online artifacts from an ESOL course I called Writing for Webheads. And WfW goes back to 1995 when I left a ten-yeared position as a lecturer of EFL at Sultan Qaboos University and took up a job working for a company in California that designed educational software and got to designate myself Director of ESL Software Design, which is how I perceived my role in the company. We then taught that this to teachers experientially, so that they learned by trying out the community building techniques themselves on one another in spaces where technology was being used online to promote a greater awareness of how it might faciitate language learning. Hi, Vance! This is such a comprehensive post. Too bad I missed the RSCON. I'm sure many teachers benefitted from this symposium. I've bookmarked this site to catch up on the tips and strategies. Thanks for this. One of best. Whatever I've seen. Your article talked many things. Network is very useful in modern society, even teacher can teach their students through webcam in net. Therefore, network bring a lot of benefits to education.